It's that time of year again! Halloween 2015 is finalle here, and from the looks of things, Hollywood is ready to party. All week, everyone's favorite celebrities have been preparing for Halloween, dressed to the nines, in their over-the-top costumes. Everyone from Nicki Minaj to Ariana Grande have joined in on the fun — so what are your favorite celebrities wearing for this year's festivities? When celebrity-inspired costumes come to mind, some stand above the others. Wearing white go-go boots, a high pony-tail, and cat ears easily make you an Ariana Grande look-a-like, while bright red lipstick, a blonde bob, and a crop top/mini-skirt combo can transform you the beauty that is Taylor Swift. Bright one piece swimsuits and furry jackets easily turn you into the dynamic duo that is Beyoncé and Nicki Minaj in the "Feeling Myself" video — and the list goes on and on. But, since we look to our favorite celebrities and musicians for Halloween costume ideas, who do they turn to for inspiration? Everyone's favorite Pretty Little Liars couple took it upon themselves to ditch the red coats this Halloween. The pair dressed as stylish vampires, with dark lipstick and colored contacts making the perfect additions to their stylishly scary get-ups. Kim Kardashian West and older sister Kourtney Kardashian's adorable daughters North West and Penelope Disick dressed up as the most popular animated sisters of their time, Elsa and Anna from Frozen! Ugh, this is so #childrengoals. The eldest Kardashian sister is showing that despite recent family drama, nothing can keep her down! Being the super woman she is, it's no surprise that she chose to channel her inner hero with these out of this world hero costumes, taking her three kids for the ride. Just like her style, supermodel Kendall Jenner decided to take things easy this year with a simple "Batman bunny" mask. Wearing her classic half-updo, Ariana Grande spiced up her Halloween costume with a large sunflower and an adorable cow costume. 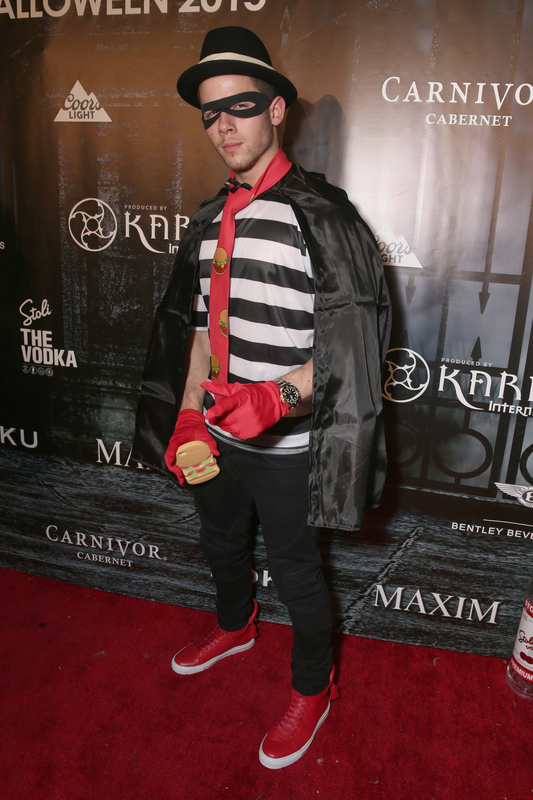 The "Levels" singer arrived to an event in this Hamburglar costume earlier this week, rocking eveyrthing from red gloves to a McDonald's tie. The energetic pop/rock band rocked up their image by amping things up as their alter ego, "5 Second of Sexx." Former Victoria's Secret Angel Miranda Kerr glammed it up this Halloween with a Black Swan-inspired costume — and of course, she was looking beautiful in her elegant outfit. This is one hairstyle that I haven't seen Bieber wear yet. The "Sorry" singer dressed up as Jackie Moon, Will Ferrell's character from the comedy Semi-Pro. So thankful for Jessica Alba bringing back this look. The actress teamed up with a friend to be Romy and Michelle from Romy and Michelle's High School Reunion. Nicki Minaj looks like she's ready to grant a few wishes! The "Anaconda" singer looked magical in her fairy costume earlier this week. No one does Halloween better then these stars. All of these costumes have given me inspiration for my costumes to come. What would we all do without some of our favorite celebrities lending us ideas for our future costumes?